When you need just a little more distance, this Cables to Go 52106 USB 2.0 Male to Female Extension Cable will extend the reach of your existing USB A/B cable. Foil and braid shielding reduce EMI/RFI interference and twisted pair construction helps reduce crosstalk for a high-speed, error-free data transfer. The Cables to Go 52106 USB 2.0 Male to Female Extension Cable is PC and Mac compatible. 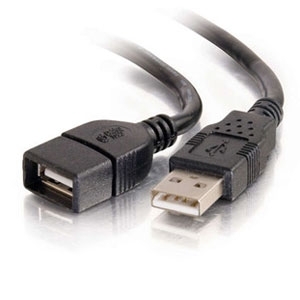 Purchase the Cables to Go 52106 USB 2.0 Male to Female Extension Cable today!